Sergeant First Class Brian Livingston joined the military because he wanted to do something great and memorable in his life, and serve on a team that he said would be bigger and more meaningful than any college he could have attended. 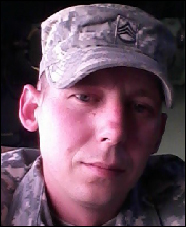 He enlisted out of Grand Island, Nebraska and served from 2000 to 2014. He endured a number of severe injuries over his 14-year military career, but one of his most vivid memories was in 2004, while deployed in Iraq, when Sergeant First Class Livingston said he and his team were investigating an area where insurgents were possibly storing weapons. Upon reaching the area, the Humvee that Sergeant First Class Livingston was riding in struck a landmine. The blast knocked him unconscious, and he awoke to the sound of insurgent machine gun fire. Sergeant First Class Livingston has been awarded the Purple Heart, Army Commendation Medal (8x), Army Achievement Medal (4x), Iraqi Campaign Medal with 3 Campaign Stars, Meritorious Unit Citation (3x), Army Good Conduct Medal (4x), National Defense Service Medal, Global War on Terrorism Expeditionary Medal, Global War on Terrorism Service Medal, Non-Commissioned Officer Professional Development Ribbon (3x), Army Service Ribbon, Gold Recruiter Badge with 3 Sapphire Stars, Combat Action Badge and the Driver Wheeled Vehicle Badge. Sergeant First Class Livingston, his wife, Erin, and their four children will be gifted a mortgage-free home in Buckeye, Arizona.